Getting a Minnesota FHA loan is a great way to buy a home or refinance an existing home loan. These loans have been around for many years and are a popular mortgage for first time home buyers. The acronym FHA stands for Federal Housing Authority. This organization began in the year 1934. At that time America was suffering through the end of the Great Depression and many citizens were still renters. Before FHA, the terms for buying a home were much more burdensome. The down payment requirement was 50% of the home’s price. The loan terms were only 5 years, at the most. However, the entire balance did not have to be paid back within 5 years. Instead, the large balance that was outstanding at the end of the term was considered a balloon payment. Buyers had the option of paying the large amount at once or signing up for a new loan, with a 5-year term, and a big balance due at the end. The government reasoned that if the number of homeowners could increase, more neighborhoods would stabilize, families would be started and the overall economy would improve. The main feature of FHA mortgages was the Mortgage Insurance Premium. This fee would be charged on all FHA loans in two ways; (1) as an upfront fee at the beginning of the loan and (2) as a small monthly amount. This Premium would allow the FHA program to provide funds for future loans and also protect lenders against loss in case some homeowners were not able to make their payments. With the guaranty of the loan being covered through the Premium, banks felt more comfortable offering the FHA mortgage. Rates dropped, terms lengthened and the number of homeowners rose over time. Getting an FHA mortgage can be accomplished by meeting several requirements. The good thing is that banks, credit unions and mortgage lenders have the ability to offer an FHA loan. This means that borrowers are not relying on the federal government to handle and approve the application. Here are the basic requirements of getting approved for the loan. FHA asks all borrowers to pay 3.5% of the home’s price as a down payment. The money may come from traditional sources such as checking account, savings account, retirement account, CD, stock or bond investments and other financial institution accounts. FHA will also allow the money to come in the form of a gift from a relative. Although it is not required to be a full citizen of the United States in order to qualify for a loan, you will be required to prove how you are in the country on a legal basis and that your status as a legal immigrant will likely continue for the foreseeable future. Each lender will have its own requirements for the minimum credit score that they will approve. The nice thing about FHA guidelines is that people with less than perfect credit can be approved for a loan. As the previous point mentioned, each lender will have its own requirements concerning the credit score. In addition, the lender may have some additional requirements that are not dictated by FHA. These additional requirements are called mortgage overlays and they are unique to each lender. If the lender approves you for a loan and explains the requirements to you, you will have to meet those requirements in order to close the loan. Since the FHA loan is backed/guaranteed by the federal government, there is one step of the loan that is the same for all borrowers. All borrowers must clear a CAIVRS check in order to get loan approval. CAIVRS is another acronym. This one stands for Credit Alert Interactive Voice Response System. CAIVRS is a database that lists any person that has failed to either repay federal student loans or federal taxes. If a person’s name turns up on this list then they cannot move forward with the Minnesota FHA loan. In order to get an approval from a Minnesota FHA lender, you will need to complete an application. The application is a form that the loan officer will help you complete. The form asks for basic information such as your name, date of birth, social security number, current address, work history, income, assets and liabilities. Along with the application, you will also need to provide the following types of information. If you intend to use your own money for the down payment and associated closing costs, the loan officer will need to verify that you have access to the money. As mentioned before, you will need to show the loan officer your documents that detail how much money you make in a year and how often you are paid. The loan officer will use this information to calculate the monthly gross income for you and your household. If you do not earn money from a job or a self-employed company, you may be asked to provide other documentation. For example, a person who receives a monthly pension may be asked to provide the last 2 month’s payout statement as well as a letter explaining how long the pension will continue. People who earn part or all of their money from rental income on investment properties will need to produce copies of lease agreements, the previous 2 year’s personal tax returns and possible a cash flow statement for the properties. If you are receiving a gift to be used for the down payment, there will be a requirement of documents to show that the money is a true gift. Typically, the borrower will need to have copies of their own account showing the deposit of the gift as well as copies of the statement showing where the gift came from. If the money was provided via a check, a copy of the check will also be needed. Lastly, a statement signed by the borrower and the giver showing that the money is a gift will be needed. Along with the previously mentioned information, there are even more facts to know about FHA mortgages. FHA also has a separate program that can be used as a type of rehab loan for fixer-uppers. This program is called the FHA 203k. The space here will not allow a sufficient explanation of the program, but a brief summary will cover the major points. The 203k loan comes in two forms. One is a streamline version that limits the amount of money that can be borrowed and how the money can be used for repairs or improvements on an existing home. The second form of the 203k loan allows for bigger loan amounts and much more extensive work to be done in the form of pure repair work or major improvements. The beauty of the 203k program is that borrowers are allowed to receive one loan, with one interest rate, without the need for a second loan designated just for the repairs and improvements. If interest rates should drop after you receive your Minnesota FHA loan, there is a possibility of getting approved for a refinance mortgage called the FHA streamline refinance. This loan does not require any proof of income, a new credit report and no new appraisal. The main requirement is that the borrower must currently have an FHA loan and that they have made the last 12 payments on time. The refinance must also result in a net tangible benefit to the borrower. The definition of net tangible benefit for simplistic matters is an overall payment savings of 5% equally comparing your current payment to the proposed. The definition varies from there depending if you’re going from an ARM to a Fixed rate, an ARM to an ARM or even changing the term from 30 years to 15 years. Ask your Mortgage Loan Officer for more details if your scenario falls in any of those categories. The FHA program has a long track record of being committed to assisting people in becoming home owners. 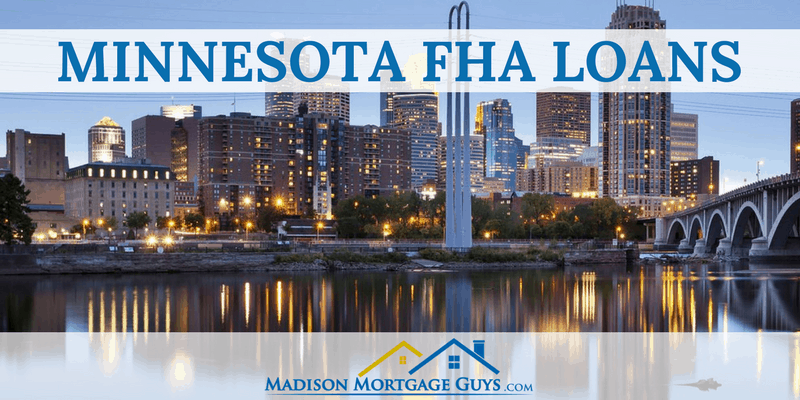 With the low down payment option, flexible credit approval rules and excellent interest rates, FHA is a great way for Minnesotans to buy a home at an affordable price.